The coming week will see the Whole Earth Summit, which is a free online 3 day seminar with some of the world’s leading activists and on-the-ground leaders. Forty-two extraordinary environmental visionaries are joining together to share valuable insights around food, water, the commons, ecological activism and design, social transformation, collective vision, and practical models for making a difference. The goal of the the Whole Earth Summit is to support all of us in creating regenerative communities and a more resilient world. 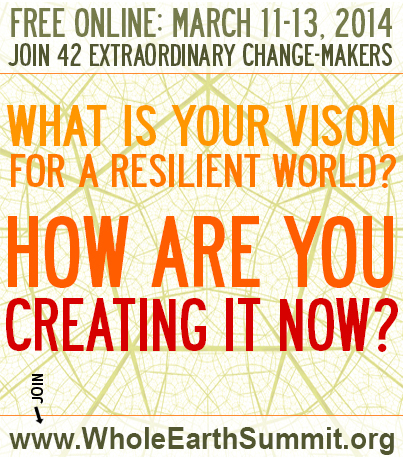 The Whole Earth Summit will be asking questions like: What is our vision for a resilient world? How are we creating it now? The Whole Earth Summit will help progressive activists to gain valuable insights and inspiration to be a more dynamic, community-oriented, and effective change-maker. A whole earth is calling us. The Whole Earth Summit will feature well known environmental activists such as Bill Mckibben. Dr. Vandana Shiva, Rob Hopkins and Raj Patel. The Whole Earth Summit is supported by a wide range of environmental organisations including: The Transition Nerwork, The Pachamama Alliance, Groundswell International, 350.org, Permaculture Activist, The Food Network and many others. Click here to register »» The sooner the better so you don’t miss out on the sessions you’d like to attend. You’ll also have access to 48-hour free replays!